After the unmitigated disaster that was 2011, it wasn’t going to take much for his 2012 to be considered a rebound and it was yet he was still a disappointment. While he wasn’t going 2nd overall like 2011, he still only dipped to 20th average draft position with a high of 12 and low of 26 according to Mock Draft Central. His 20-20 season with shortstop and third base eligibility wasn’t bad, but it didn’t earn that draft position back. ESPN’s Player Rater had him 63rd overall and 42nd among batters. The problem was that there was virtually no rebound in his paltry .243 batting average from 2011. It went up to .257, but that’s barely a dent (8 hits over a 600 AB season) and he posted the second-worst BABIP of his career at .290 (up slightly from 2011’s .275). His batted ball profile was actually somewhat conducive to a batting average increase as he added 2.5 percent to his line drives, which have the best chance to become hits. 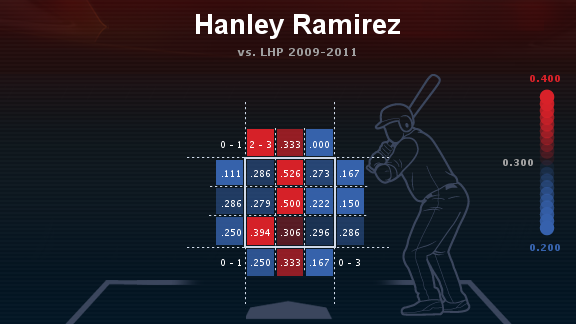 His flyball rate rose continuing a three-year trend, and those are least likely to become hits. While his flyball rate only ticked up by 1.2 percent, his infield flyball rate jumped four percent and those are all but guaranteed outs. Based on my rough math estimations, a .300 average would’ve boosted Ramirez to a tie for 11th among batters in the player rater with Adam Jones and vaulted him to 18th with Jones in the overall. 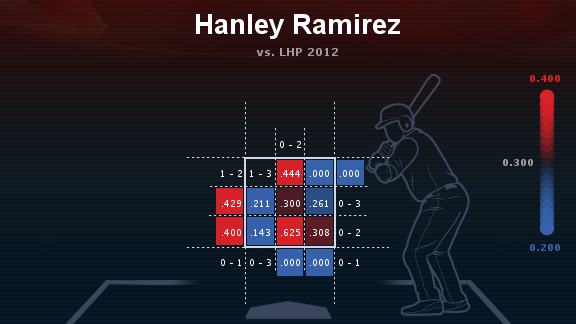 It appears that Ramirez’s batting average issues for 2012 fit under the Occam’s razor principle: he just wasn’t good enough. No logistical pretzels about this BABIP or that venue. He simply didn’t hit the ball well enough to earn a .300+ average. I mean, we’re really only talking about a hit a week here. Another 26 hits would put right at .300 (actually .2996688, but I think MLB would go ahead and give it to him) and that feels like a lot, but there are generally around 26 weeks in the season. He has a track record of excellence so the potential to return to those levels is still present. He is still on the right side of 30, adding to the likelihood of the first point. His “down” seasons are still 20-20 seasons with 92 RBIs. Well down seasons without injury. Ramirez is solid “buy” target for 2013, even as a second round pick (though his ADP is a ludicrous 42 in early drafts** over at Mock Draft Central making him a huge bargain if that holds, but I doubt it will). High floors are a market inefficiency and they can sometimes be more important than a high ceiling for an early round pick. Especially if you subscribe to the notion that you can’t win your draft in the early rounds, but you can lose it. In other words: ignore that ADP because there is very little chance you’ll get him at that price. Don’t forget the countdown continues on the weekend! Posted on Friday: 01.25.2013 at 5:34 pm in Analysis, Baseball, Catcher, Countdown to Spring Training, Fantasy Baseball, Off-Season, Player Focus, Shortstop, Statistical Analysis, Strategy, Third Base	| RSS feed You can skip to the end and leave a reply.